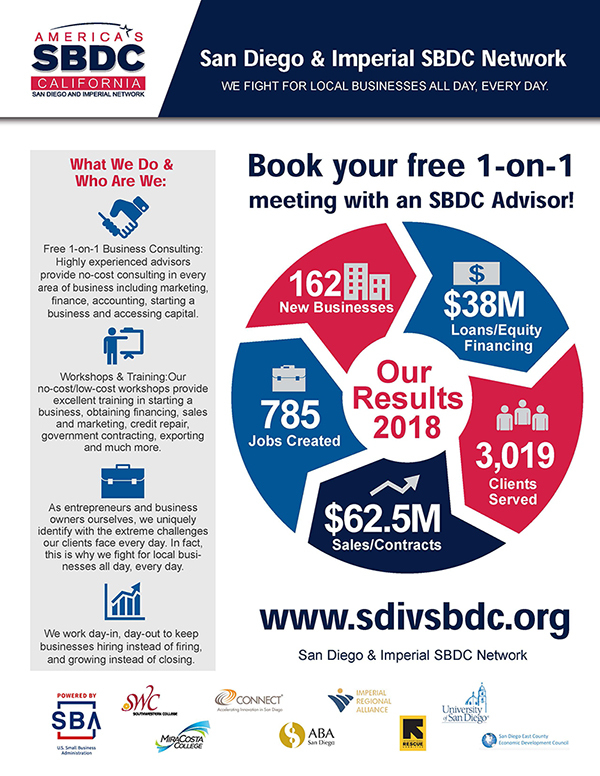 For over twenty years, the Small Business Development Center (SBDC) has been providing small businesses with the information and tools they need to thrive and prosper in the San Diego & Imperial region. The Regional SBDC Lead Center is based at Southwestern College and is the hub of three primary service centers: the San Diego SBDC, the North San Diego SBDC, and the Imperial Valley SBDC, in addition to specialty centers ConnectAll SBDC and theBrink SBDC, as well as micro-centers at the International Rescue Committee (IRC), Asian Business Association (ABA), and East County EDC. The SBDC Network is focused on supporting and empowering small businesses. Through a team of professionals, the SBDC promotes economic growth by helping entrepreneurs develop and expand operations. This partnership fosters job creation and retention, capital investments and dynamic innovation that supports a higher quality of life for our community.